Hillary Clinton surprised the crowd at a Tribeca Film Festival panel Saturday night, walking onstage to applause at the premiere of a virtual reality short by Oscar-winning director Kathryn Bigelow. 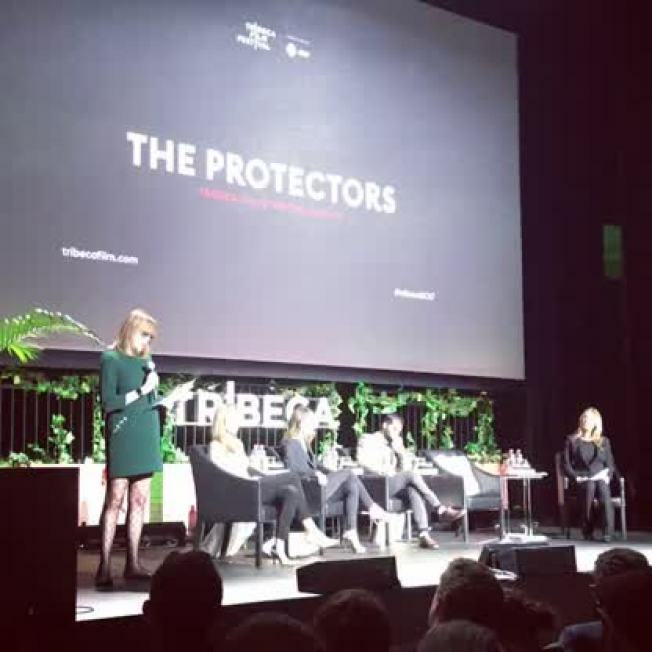 Clinton was an unannounced panelist, there to discuss the scourge of elephant poaching — the subject of Bigelow's eight-minute film "The Protectors: Walk in the Rangers' Shoes," about park rangers trying to save elephants in Garamba National Park in the Democratic Republic of the Congo. Before Clinton and the three other panelists were interviewed by Bigelow, the audience donned virtual reality headsets at their seats and experienced — in 360 degrees — what it's like to be one of the 200 rangers fighting well-armed poachers in the park the size of Delaware. The film gives the viewer both the experience of being in the grass and searching for poachers, and up in the air looking down. A wrenching scene shows the rangers arriving at the carcass of a slaughtered elephant. Clinton told Bigelow that her virtual reality film was "so critical, because it is a portal — a portal that people can go into and think about, 'Here we are in New York, what can I do?' And there is a lot that can be done — stop the killing, stop the trafficking, and stop the demand. And part of that is protecting these rangers, who are up against some of the most ruthless killers anywhere on the planet right now, and doing the very best they can."